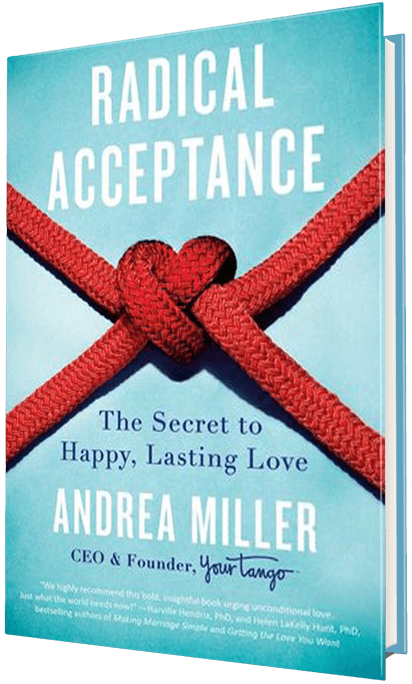 Author Andrea Miller–the founder and CEO of YourTango, the wildly popular website dedicated to love and relationships–shares the secret to happy, lasting love. 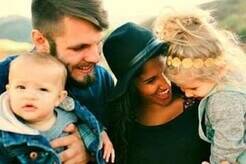 Radical Acceptance can greatly improve—and even transform—almost any relationship: with your spouse, children, parents, girlfriend/boyfriend, siblings, friends, colleagues, as well as, crucially, with yourself. On sale now! Buy your copy and become a Radical Acceptor today! Loving your partner without judgment is the ultimate gift you can give them—and yourself. Loving the lovable parts of your partner is easy. He’s funny, charming, smart, successful, and kind. He’s perfect. Except for when he is not. Like when he is late. Or short-tempered. Or impatient. Or lazy. Or he has just loaded the dishwasher incorrectly (again). Maybe he suddenly feels like the most frustrating person on the planet. Or maybe you’re simply not feeling heard or seen. Or loved enough. It’s these proverbial unlovable parts that make loving all of him so tough. But imagine if you let go of your itch to fix, judge, improve, or control your partner. Imagine if you replaced judgment with compassion and empathy. Tremendous empowerment and liberation come from loving someone—and being loved—for who we really are. This is called Radical Acceptance. Whether you’re looking for Mr. Right or are already with him, this is your powerful five-step guide to attaining life’s ultimate prize: unconditional love. Through Radical Acceptance, you’ll learn how to increase your emotional resilience, feel more confident, determine whether you’re settling, quiet those doubt-filled voices in your head, get out of that endless cycle of dead-end dates, reduce conflict, and build a deeply fulfilling, affirming relationship—all through highly actionable advice. Best of all, you will discover how amazing it feels to have your heart expanded by an abundance of love and compassion for your partner and yourself. Featuring compelling stories from real-life couples and insights from the foremost thought-leaders and researchers in brain science, sexuality, psychotherapy, and neurobiology, Radical Acceptance illustrates that embracing your partner for exactly who they are will lead to a more harmonious relationship—and provides an unexpected path to your own personal transformation. "A warm, honest approach to prioritizing your partner and creating true happiness in your relationship--and in yourself. 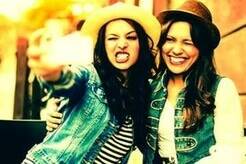 Andrea is like the friend everyone needs in not only the tough moments, but the good ones too. A compelling book." "Perhaps no one is better qualified than Andrea to simplify the secret to love and intimacy. She brings together the wisdom of YourTango's amazing experts and the millions of visitors and their experiences. A beautiful work." 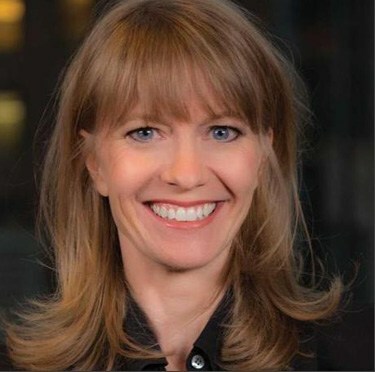 Andrea Miller is the founder and CEO of YourTango, the leading online magazine dedicated to love and relationships. YourTango’s mission is to help women love better and connect more meaningfully as those are key ingredients to being happy and feeling a greater sense of belonging. YourTango has built a powerful platform where a community of readers, writers, brands, thought leaders, and the world’s leading relationship and mental health experts connect and engage where it matters most: the heart. Andrea’s first book Radical Acceptance: The Secret to Happy, Lasting Love debuts May 2, 2017 and will be published by the Atria Division of Simon & Schuster. Andrea serves on the Board of Trustees of the New York Theatre Workshop. She has been awarded a black belt in Shotokan karate by the Japan Karate Association (JKA), is a licensed private pilot, loves to ski and has mastered doing yoga to episodes of Power Rangers. Andrea and her husband live with their two little boys in New York City. It may not be easy, but it's SO worth it. How a little radical acceptance just might change everything. Once you’ve seen someone’s darkest parts, it’s hard to go back. That will radically change your relationship for the better — seriously! Why you should accept your partner ... only to a point. Accepting my “Now” makes tomorrow less terrifying. There is no point in holding on to something you're not 100% sure about. You CAN learn to love better. Loving your friends, despite their flaws, is hard. I spent two months not acting like a jackass… for love. Maybe your husband's "annoyances" have less to do with him and more to do with you. Why do so many of us buy into the myth that marriage is supposed to make us happy? These 5 steps will show you the true face of unconditional love. YOU have to be the person YOU want to be to find the love YOU want. A person is not a fixer-upper project. "Love begins with you" is easier said than done.